Donkey Kong was originally released in the Arcades in 1981 and was later ported to most home computers. Instead of stretching everything to 4:3 the developers retained the portrait look of the arcade version which gives the game a greater sense of scale. The first screen takes place at the bottom of a construction site and you must reach Lady while avoiding barrels that DK throws at you. Being used to the NES version I was taken aback by how tough this initial screen was. Barrels come at you from everywhere and it will take a few attempts before you reach the top. The main advantage of this port is that it includes the arcade version's second screen called Cement Factory. Unfortunately it's the most boring screen in the whole game - it's main gameplay mechanic involves conveyor belts and moving ladders but they're more of an annoyance than anything else. In the third screen you use moving elevators and make some tricky platform jumps; it's probably the closest thing to a typical Mario game! The final screen takes place at the top of the construction site and your task is to remove eight rivets that are scattered around. If you manage to do so DK will fall and Jumpman will be reunited with Lady. The game then loops and you move on to the next difficulty level. If you're used to later Mario platform games the controls might seem a bit stiff - you quickly adjust to them though and I like that you can jump backwards to avoid enemies if you're facing the wrong direction. While the animation is primitive and the arcades' cut-scenes are nowhere to be found, the graphics look amazing for a CPC title and each stage is beaming with colour. The music and SFX are nothing special but all the familiar sounds of bouncing springs and DK falling at the end of screen 4 are present. 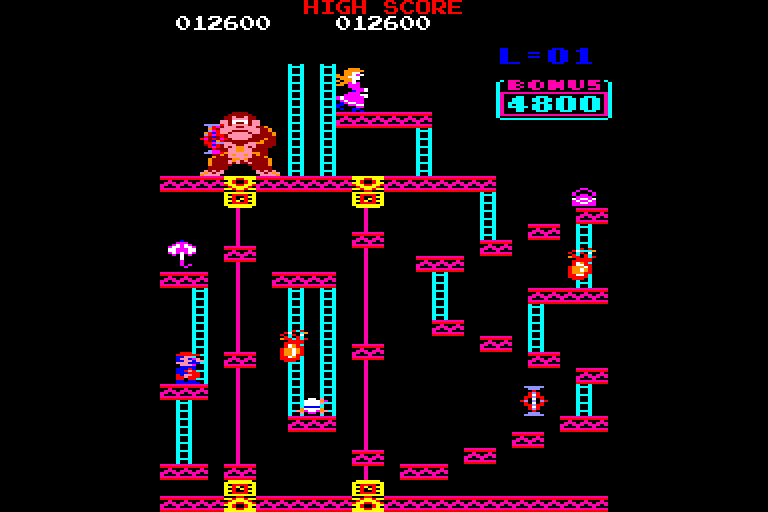 Donkey Kong on the Amstrad CPC is one of the best versions I've played of this classic arcade game. Not only is it the one of most complete home ports you'll find, it controls amazingly well and is still a joy to play. Random trivia: If you've never seen it check out the movie called The King of Kong: A Fistful of Quarters - it follows a group of retro gaming enthusiasts as they try to beat the world record in the arcade version of Donkey Kong.